You can spend countless hours preparing the ingredients for the turkey, stuffing, and dressing for Thanksgiving or you can simply treat the entire family to a lovely meal at a restaurant offering traditional and not so traditional Thanksgiving fare. Not only will you do away with the prep work and clean-up in the kitchen, but you will not have to worry about leftovers either. Most restaurants have pre-fixed prices, though a couple also offers a la carte items. Here are some of the best restaurants for celebrating Thanksgiving in Miami. Jaya offers a Thanksgiving Day Brunch on Thursday, November 22rd, 2018 from 11:30 a.m. to 3:30 p.m. There will be live jazz, free-flowing Louis Roederer Champagne, and seasonal apple cider. The brunch includes traditional turkey and stuffing, a wide range of meats at their live carving station, an extensive seafood selection, and a lavish buffet of Asian specialties such as traditional Pad Thai and Indian Lamb Vindaloo. The price is $125 per person and $63 per child 5-12 years (tax and gratuity are extra). This Thanksgiving Ariete a buffet dinner with unlimited helpings of roasted and fried turkey, stuffing, honey baked ham, chicken with salsa verde, and local fish with heirloom tomato ragout, among other offerings. The buffet price is set at $65 per person with children under 10, $35. The Dutch serves hearty American food, locally-sourced whenever possible and will be open for Thanksgiving. At the Dutch, the cider-brined turkey will be served with andouille sausage and pecan stuffing, whipped potatoes, spiced cranberry chutney, maple-bacon Brussels sprouts, and Honeycrisp apple and marinated beets followed by a choice of desserts. This prix-fixe meal is $55 per person. The restaurant will also have limited items, including shellfish, available from their regular menu. The Dutch, located inside the W South Beach, will be open for breakfast and will serve the prix-fixe courses starting at 1 p.m.
For those who want to try something completely different this Thanksgiving, head over to Sushi Samba to dine on exotic menu items. Sushi Samba offers a creative twist on Thanksgiving dinner or a selection from their full signature menu. You can have turkey or sushi, red wine or sake, pie or Mochi—it's all up to you. The restaurant is located in the Lincoln Road Mall. Lightkeepers at the Ritz-Carlton is serving up a Thanksgiving feast from 12:30 p.m. to 8 p.m. The price is $145 for adults and $49 for children, ages 5 - 12. Tax and gratuity not included. You'll enjoy a holiday-themed buffet and bottomless beverages. Reservations are required. Call (305) 365-4186. At Bourbon Steak, enjoy a traditional turkey dinner from 4 p.m. to 11 p.m. featuring roasted butternut squash soup, wood-grilled free-range turkey and garlic mashed potatoes. The price is $95 for adults and $35 for children ages 5 - 12. 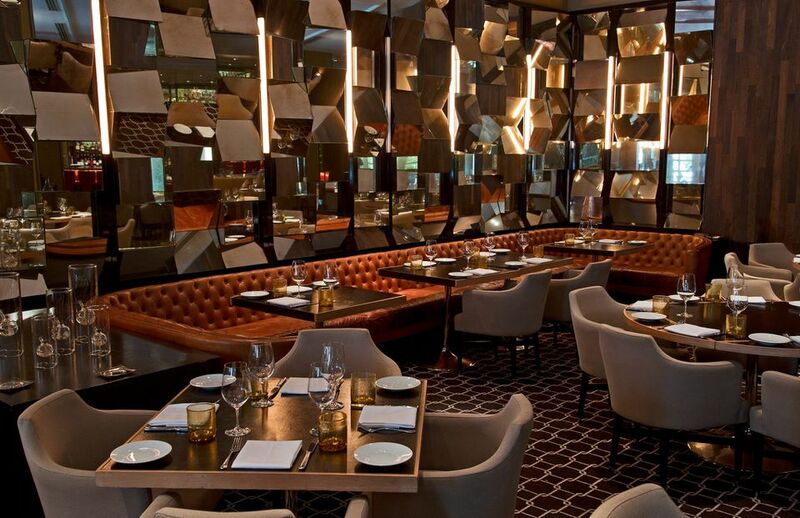 The restaurant is located at the JW Marriott, Miami. The Fountainbleu provides a full range of Thanksgiving meal experiences at their restaurants. At Scarpetta by Scott Conant, you can enjoy an Italian inspired four-course Thanksgiving dinner with Pumpkin Casonsèi, il Tacchino, and Pumpkin Spice Tart for $75 per person or feast from the à la carte dining menu. For a more casual celebration, try Vida's expansive Thanksgiving day buffet. Guests can enjoy an array of salads, side dishes, kinds of pasta, rotisserie meats with accompanying sauces, sushi, shellfish and ceviche, charcuterie, cheeses, and desserts. For those who just want to splurge on dessert, Chez Bon Bon's artisan chefs have created festive pies, cakes, tarts, and one-of-a-kind specialty treats for the holiday. You'll satisfy your sweet tooth with irresistible holiday cookies and other indulgent delights to eat in or take out. 6 a.m. - 11 p.m.